IJFNPH intends to contribute to the improvement of public health, nationally and internationally, through quality research and a better understanding of the science involved in food, dietetics, nutrition and public health. This unique initiative aims to integrate the study of these various disciplines to promote better health for all sections of society. Today, in recognition of the fundamental importance of food and nutrition to human life and wellbeing, there is a growing demand for knowledge transfer, in order to inform skilled public health professionals, nutritionists, food professionals on key issues regarding the pivotal role of food and nutrition in influencing the health outcomes in a given population. Objectives: The objectives of IJFNPH are to establish an effective channel of communication between food scientists, nutritionists, public health professionals, policy makers, governmental and non-governmental agencies, and others concerned the food, nutrition and public health dimensions. It aims at “Balanced Nutrition for Healthier Populations” which will consequently promote public health and combat diseases. Contents: IJFNPH publishes peer reviewed original papers, review papers, technical reports, case studies, conference reports, book reviews, commentaries, and news. Special Issues devoted to important topics in food sciences, nutrition and interventions and public health will occasionally be published. 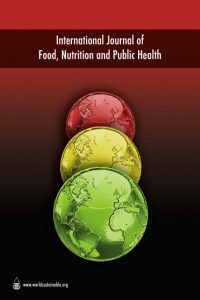 Readership: IJFNPH provides a vehicle to help public health professionals, academics, researchers and food scientists working in the fields of food science, nutrition, diseases prevention, health sector and governmental bodies to disseminate information and to learn from and discuss each other’s work.